Recognizing parakeet illness symptoms is something you should definitely know how to do. The good news is that these little birds are pretty strong and don't get sick often. The fact that you are keeping one or two little birds in a small apartment can be an advantage. This will keep them pretty isolated from diseases. 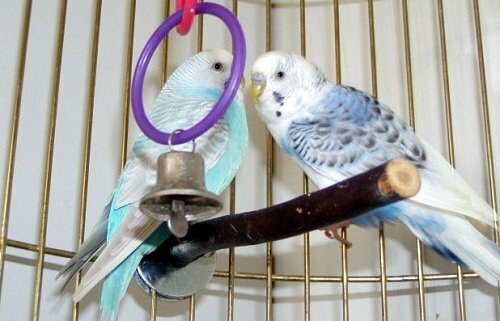 Budgie parakeet is one of the most resistant pets kept in captivity and he rarely gets ill. Still, it does happen. Parakeet illnesses do exist and we need to be prepared. Since you can't take the pet to the avian vet every day it would be very good to know how your pet looks when he is sick. 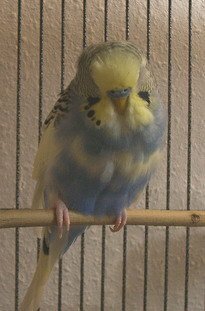 Before knowing how a sick budgie parakeet looks like, let us make sure we read some basic information on keeping a budgie parakeet healthy. You did all you could to make sure your parakeet gets good care - but he still got sick? Do not despair. At that moment it is more important to make sure we recognize some parakeet illness symptoms and contact the vet or do some emergency procedures (first aid) until we do contact one. As a reminder, it would be good to find an avian vet even before you bring your pet home. Sometimes it is hard to find a good vet specialized in birds even when you have time, let alone when it comes to having an emergency bird situation. Here are links that can help you find a vet in USA or you can search for a vet in UK. Most of the times these little birds will get sick suddenly, you will not see it coming. But the symptoms are pretty visible. First parakeet illness symptoms can be put into behavior changes category. The bird is not interested in things he usually likes. He is not playing with his toys. If he normally plays with you, you will see a change there too. Even the most tamed parakeets do not let people catch them; well, it will be very easy to do this once he is sick. The pet will just behave as if he does not care. A sick parakeet looks all fluffy (not in a cute way though). He keeps his eyes closed. His head is usually stuck into his feathers. These are parakeet illness symptoms you definitely should not neglect as they are clearly showing something is wrong with the pet. He is not standing the usual way but sitting down (or better yet - laying down) with all of his lower part of the body on the ground. His tail is just hanging. The bird has no appetite and sometimes he sits next to the food dish just looking at the food. The bird might even be throwing up and you can see how the area around his beak is dirty. Your parakeet's droppings are always going to tell you a story about the illness since it is one of the first symptoms of any problems. You can easily see changes in this, even when it is just a simple cold. Are droppings mucous like? More like water, even some blood in it? Or is it dark green? These are things you need to tell your vet when asking for advice. The droppings are something you will probably notice the first. It will be your alarm to take the budgie parakeet to the vet. Sometimes the bird's wings are hanging and whole body is trembling. He breathes heavily with his beak open. When he is in pain he will stand with his legs wide spread and beak open trying to get some air. At the same time the bird has trouble maintaining his balance on the perch. More parakeet illness symptoms are: feathers falling out in large amounts, strange swellings on its body, scabs, change in body mass, etc. At the beginning of my pet adventure, my sister and I experienced our parakeet being sick and unfortunately dead. Loosing a pet is terrible especially when you are a child as we were at the time. What happened is that we bought a parakeet that was already sick, but we did not notice it at the time and basically did not know anything about pets. First day at our home the pet had a diarrhea but not all the time, maybe several times that day, the rest was normal. After consulting friends that had pets, we thought it is just the reaction to his first day in new home. Second day in the evening, he fell to the bottom of the cage, trembled a lot, and had so much trouble breathing. He did not object at all when we took him in our hands and tried to give him some water. It did not work. We did not have a vet ready nor there are any emergency numbers to call so he died. Of course, the situation that night was much more tense and painful. He was in a lot of pain but I do not want to get your mood down. Still, I want to tell you that having pets is never as easy as people think. Especially when a bad thing like this happens. You can just imagine how many tears there were from two little girls, my sister and me. This terrible situation made us so much wiser. If we have had known what parakeet illness symptoms are, maybe we could have saved him. Since than, if I was taking a pet I did not know anything about, first there is studying the specie and only after that would a new kind of pet enter our home. There is so much to learn about any kind of pet. But in these busy days and so much work to do, almost no one has any time any more. That is why I processed all my knowledge to these pages in order to try to help you prevent all those unpleasant situations with sick pets.